In the final article in my highlights from MIDEM series, I talk to Elisabeth Racine of Cap Digital, the French non-profit business cluster for digital content and services, about their work with some of France’s biggest up-and-coming music startups. This year, Cap Digital in conjunction with La French Tech had a big presence at the renowned music conference, showcasing many of their music focused members. Tell me a bit about Cap Digital’s participation at this year’s event and how this has evolved over time? We’ve participated at MIDEM since 2010, kindly hosted at the Ministry of Culture’s stand. 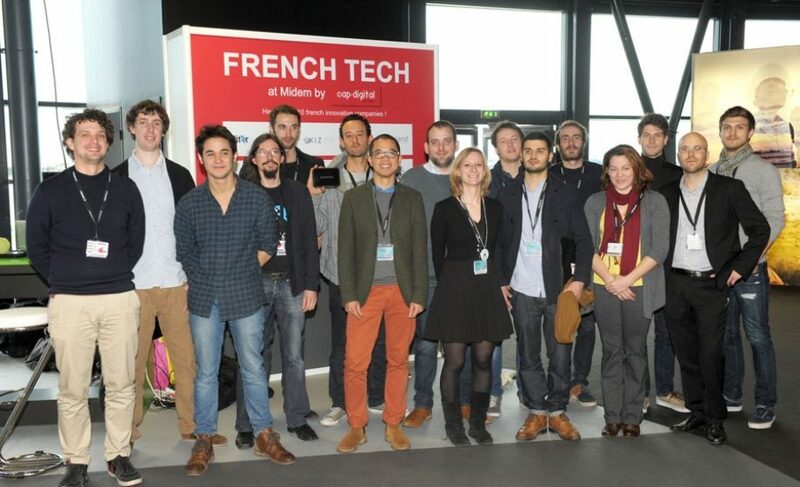 This year was our turn to host at our own stand 10 french startups, who are also our members, and give them the opportunity to put on display their digital innovations and disruptive business models. These companies offer a range of different services : recommendation, diffusion, creation and music learning. Our goal at Cap Digital is to help startups in their development through support, advice and networking. We have seen MIDEM evolve through the years, focusing increasingly on music technology, and we are glad to see that France’s tech music ecosystem come out in force for this year’s edition. Can you give us a look at the startups who exhibited with Cap Digital this year? The idea of Blitzr, finalist in the Midemlab Competition, is to gather information from databases, social networks, streaming services and marketplaces in one place. The goal of Blitzr is to become the place where music lovers find information about the artists they like and their music as well as discover new ones. Their name represents several themes : Flashing into something, the speed of discovery, as well as various other references including : David Bowie, the Ramones, videogames, even football (as a “blizzer” is a player who runs very fast”). Their marketing campaign is very original, going beyond the typical marketing tactics. So everything from creating mobile apps focusing on features like price comparison services to cartographies by place or genre or even funny ones like “discover an artist’s real name”. Findspire is a platform about discovery and artistic inspiration. The user can navigate the site and search for information by general topics like image, music, video, lifestyle and alternative future. Based on these topics “communities”, which are in turn linked, are created, which allows people from different art forms can connect and even upload content for each other. The business model is mostly based on adverting, but also on premium content and advanced features. The founders are working on other models to monetize content, including developing a music platform enabling artists and distributors to generate revenues. In a context where creation needs support and artists need to receive fair royalties, Kizym.com offers artists and fans the freedom to share their music by allowing them to choose audio formats and rate themselves. Kizym aims to become a major European player in the years to come in the discovery, sharing and support of music creation. Meludia is a game that allows everyone to understand music. The co-founder is a composer who searched about this topic for around 25 years.Their ultimate goal is to multiply the number of musicians in the world, to help people being in touch with the music. Their business model is based on subscriptions and freemium accounts. In the second quarter of 2014 they’ll be raising a seed round via convertible debt. Niland develops music search and recommendation engines. They are based on music signal processing so that they can handle any kind of music…famous or unknown, and non-western music such as Indian or Chinese. Their first product, Siilar, is a “music search environment” designed for catalog owners (publishers and libraries). It’s a new tool for music licensing projects, allowing its users to “use music to find music”. For instance, it enables you to find automatically all the songs that sound similar to a musical reference. Signal processing technology can be the next revolution in music discovery, beyond the metadata capabilities. Phonotonic develops musical connected objects (Internet of Things) that radically change our experience of music. Their product Music Battle is a consumer musical game that transforms movement into music in a unique way. Based on latest sensors and sound interaction design technologies, this game opens up the way for a new generation of digital games, without screen, that reintroduce physical into digital music. Phonotonic is a spin-off of world leading lab in music and sound technology IRCAM, gets support from business incubator AGORANOV as well as from the french cultural center Le CENTQUATRE. Traxair is a global solution to monitor broadcast in public places. It has been created to help in allocating distribution rights to the right artists. This tool, based on a music identification software, can represent an important change for independent artists and labels. Snowite is a digital mediation platform that helps publishers and majors use their catalogs for new business opportunities, such as premium deals and B2B partnerships. The “backend as a service” platform creates music APIs to build entire frontends on web, mobile and IPTV. Sounderbox wants to change access to music in public places via its collaborative playlist that allows clients and users to do the musical programming. You just need to connect the box to a screen, an audio system and an ethernet connection and the game is on. On their smartphones, tablets or laptops users can select and share tracks via the streaming access (Soundcloud, Spotify or Deezer) and create collaborative and social playlists. Users can also vote for their favorite song. The most voted track goes next on the playlist. Weezic, who recently won the midemlab competition in the Direct-to-consumer Sales and Content category, was created to stimulate musicians to work with the help of technology. Born as a customised accompaniment, it has evolved to an augmented music sheet, useful for both musicians and teachers. In this interactive score you can adapt the pace and the number of instruments playing, sync to any audio or video performance and even see mistakes in real time. What has been the value of exhibiting at MIDEM for the startups you’ve mentioned? Being at this important music gathering has been a useful experience for the startups we’ve been working with and they are all very satisfied with it. They have been able to listen to interesting conferences, to improve their pitching skills as well as have the chance to meet clients, investors, partners and collegues from all over the world in an informal context and starting building their credibility as actors of the music industry. Meeting music startups has been an enriching experience for me too : I discovered creative projects, passionate and dedicated music lovers and a general will to create pedagogical and cultural value. These smart and young companies have proudly represented our country during this international event. For us it’s crucial to continue to encourage their growth and support them as they venture out into the international market.